Hello! I hope that you guys are enjoying your Thanksgiving break. It went by much too fast! It seems as though I just came back to Richmond yet I leave tomorrow for Philadelphia around noon. I am most definitely ready for winter break. Only a few more weeks to go- we'll see if I can make it through finals! Today I wore my new boots that LAMO footwear sent me to review on my blog. These are the "Sammi Boots" in Forest and they can be purchased HERE for $107.99 + shipping. What originally drew me to these boots was the unique color and the boho-chic fringe. These two design elements insure that you will hardly ever be caught wearing the same boots as someone else. However, my favorite thing about these boots would have to be how warm and cozy they are. Maybe it's the "extra dense sheepskin insole for maximum cushioning" of the boots that have my feet screaming "yes, yes, yes"? I am also very impressed with the quality of these boots. They appear to be very well-made and I feel as though they will last a long time. These are the perfect boots for those lazy days when you don't feel like getting all dressed up. If you are looking for a new pair of comfy-cozy boots, I would certainly recommend LAMO footwear. And make sure that you check out their Cyber Monday sale! 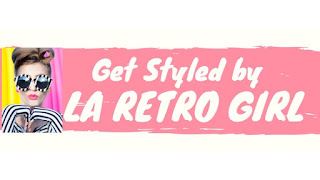 This upcoming Monday, LAMO will be offering shoppers 30% off with the discount code: CYBERLAMO. 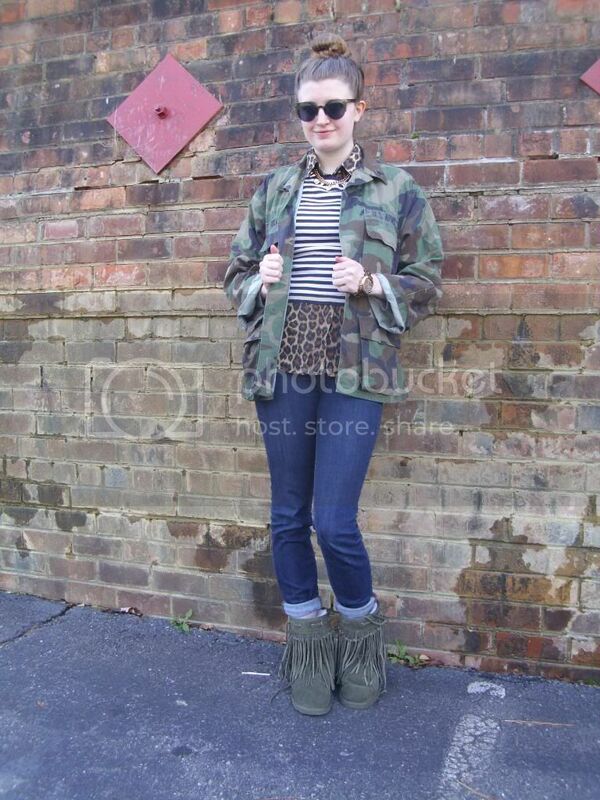 For this look, I styled the boots with a pair of high-rise denim, a leopard print button down and a striped top. 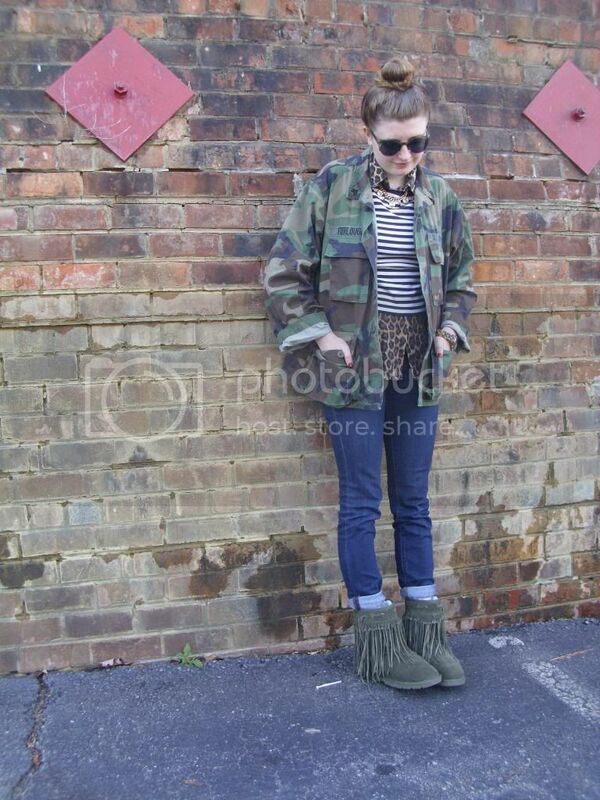 I emphasized the stunning color of the boots with my camouflage jacket and green sunglasses. A golden necklace and classic watch completed my look. Hello! Happy Thanksgiving! Thanksgiving is one of my favorite holidays of the year as it signifies the start of the holiday season. Bring on the holiday cheer, ice skating, candy canes, snow, cozying up in scarves and sweaters, festive decorations and cheery music. Today, I wore one of my favorite skirts- my black and white polka dot circle skirt. I paired it with a simple white top followed by an open knit black sweater. The open knit texture of the sweater almost makes it appear as if I am wearing polka dots on top of polka dots and I'm perfectly fine with that as polka dots are one of my current wardrobe obsessions. To add a pop of color to my look, I donned a pair of sheer orange tights and an orange knit scarf. 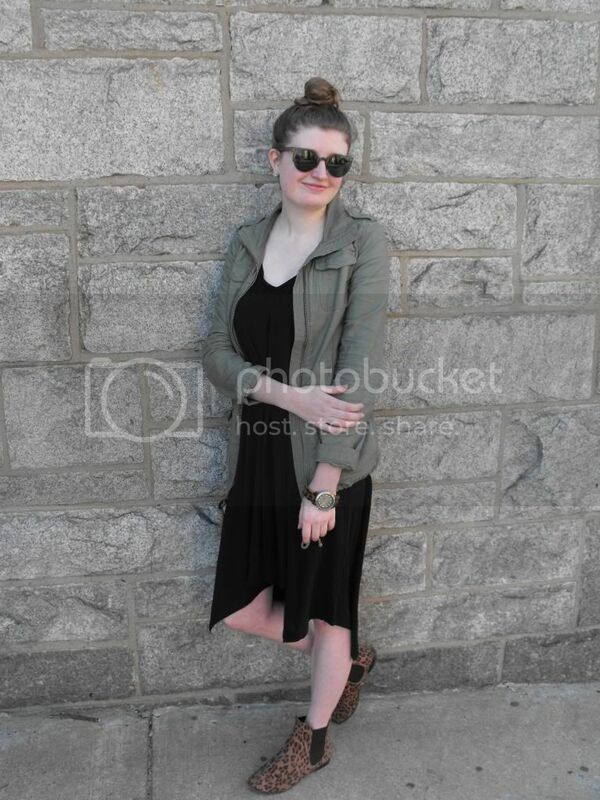 I accessorized with a pair of black winged sunglasses. Hello! These photos were taken last Thursday. 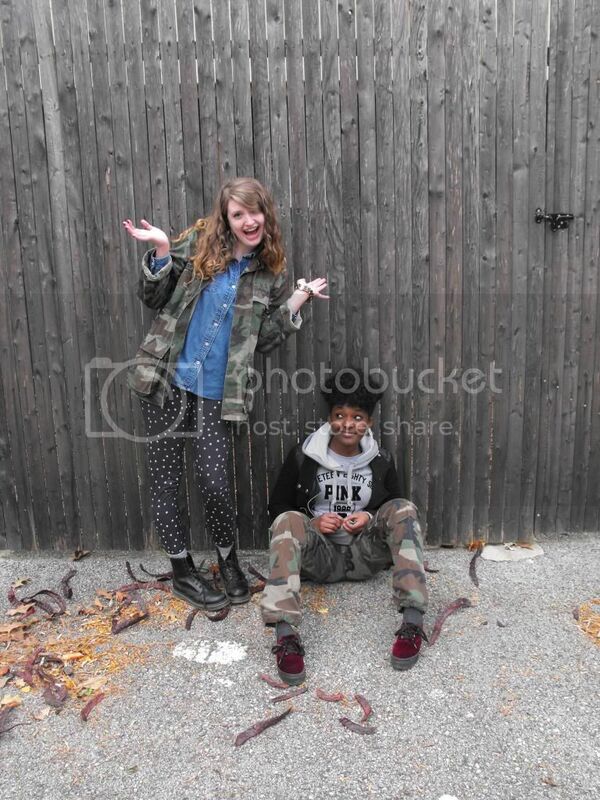 Coincidentally, Taisha and I both wore camouflage and I jumped at the chance to take photos together. Although Taisha and I have very different senses of style, we have many similar pieces in our wardrobes (we even have the exact same shirt from Urban Outfitters!) It's not unusual for us to be wearing very similar pieces on any given day but we style them much differently. 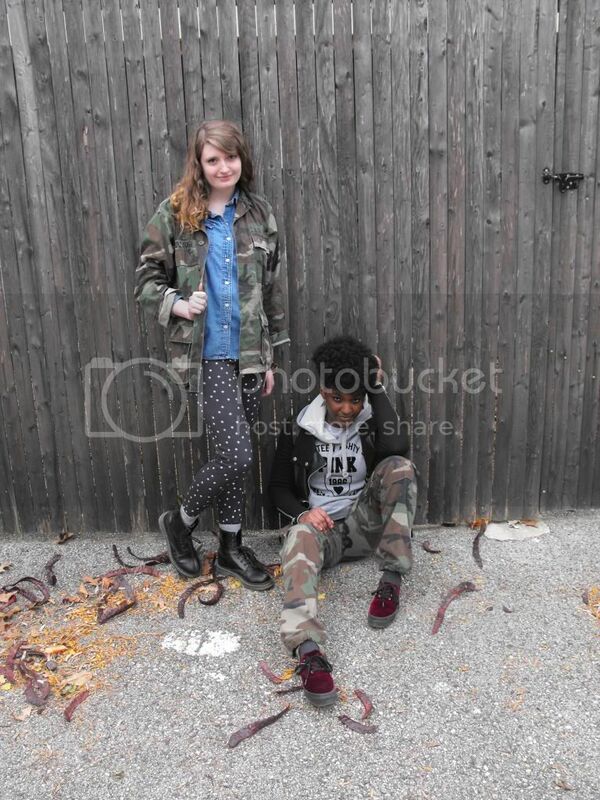 On Thursday, I styled my camouflage jacket with a pair of polka dot leggings. It was freezing outside so I actually layered a pair of plain black leggings underneath of them. I have a feeling that layering up on leggings, tights, pants, etc. is going to become a regular habit here this winter. It's much colder already than I expected! And don't even get me started on the wind. Huge gusts of wind make it seem much colder here than it actually is; the wind just blows right through you. 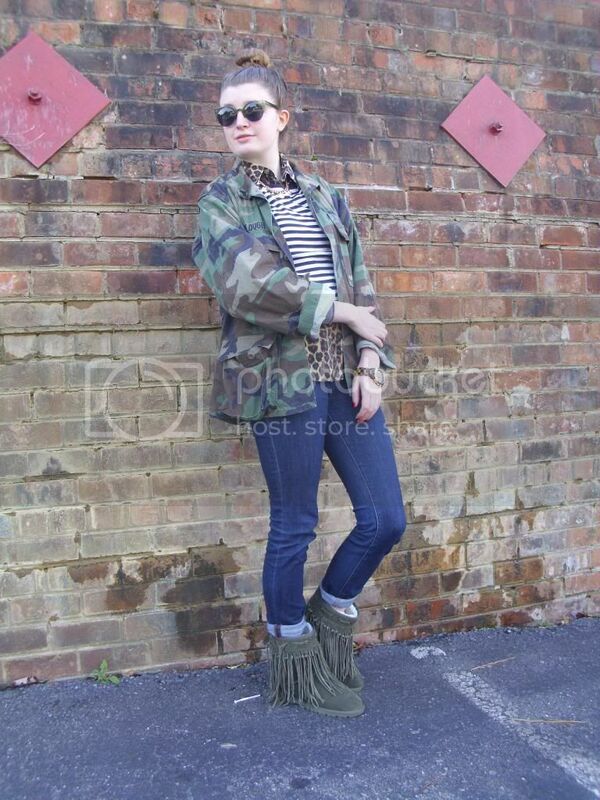 I also styled a denim button down with the camouflage jacket. I like the utilitarian vibe of the two pieces together. A black tank top also added warmth underneath of the button down. 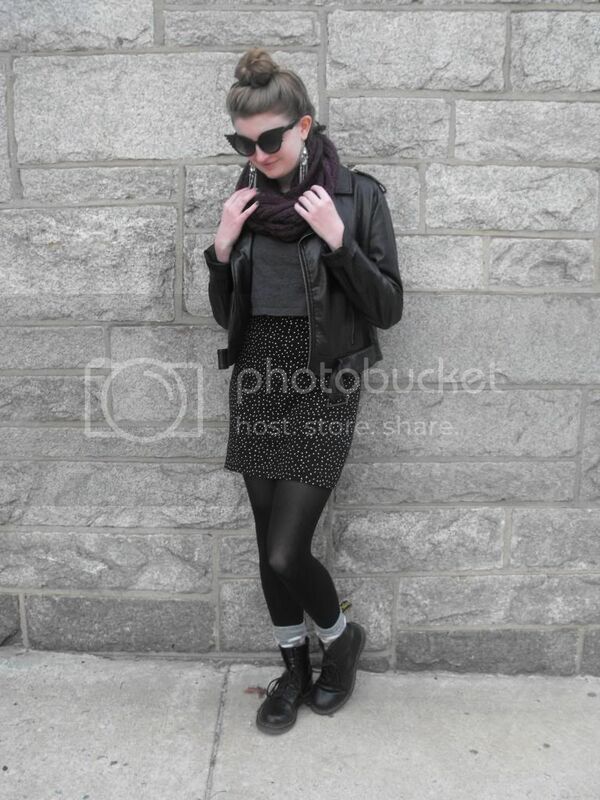 That day, I donned go-to pair of shoes: my black Doc Martens. I wore a cute pair of gray and white polka dot socks that peeked out of my boots. These polka dot socks are my absolute favorite pair of socks ever. I purchased them at H&M on sale at the end of last summer and could not be any happier with my purchase. Of course, I love the polka dot print but they also keep my feet infinitely warm and cozy. I wish I had stocked up and purchased more pairs! I accessorized with a pair of golden, vintage Chanel earrings and a classic, tortoiseshell watch. Like I mentioned earlier (and that you can see in the photos! 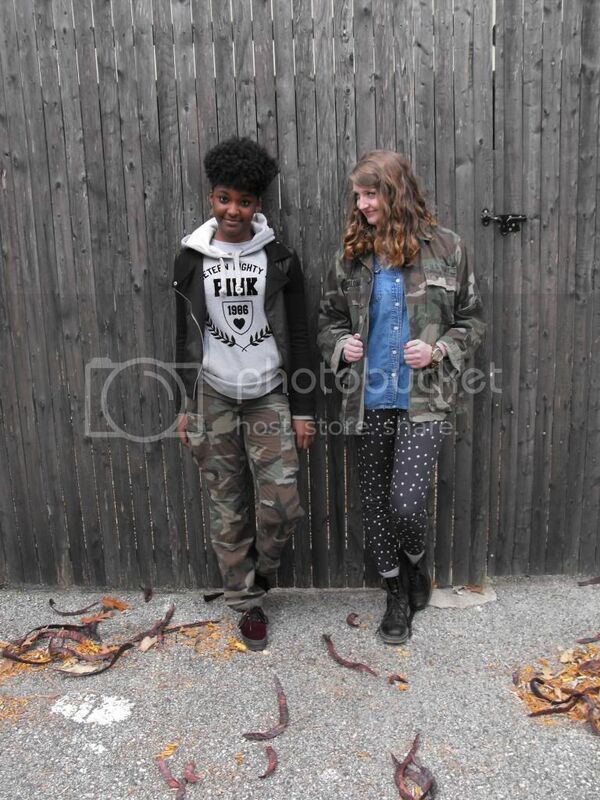 ), Taisha also wore camouflage. 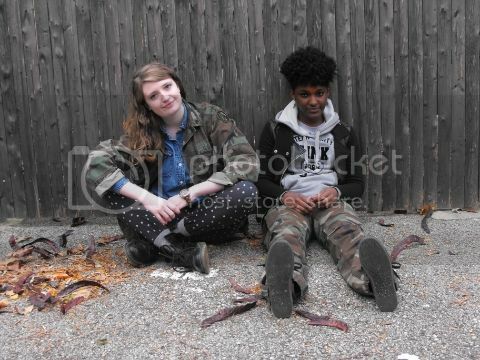 But instead of wearing a camouflage jacket, she wore camouflage pants. She styled them with a vintage gray sweatshirt followed by an edgy black jacket. I really like the pop of color that her burgundy, velvet creepers add to the look. 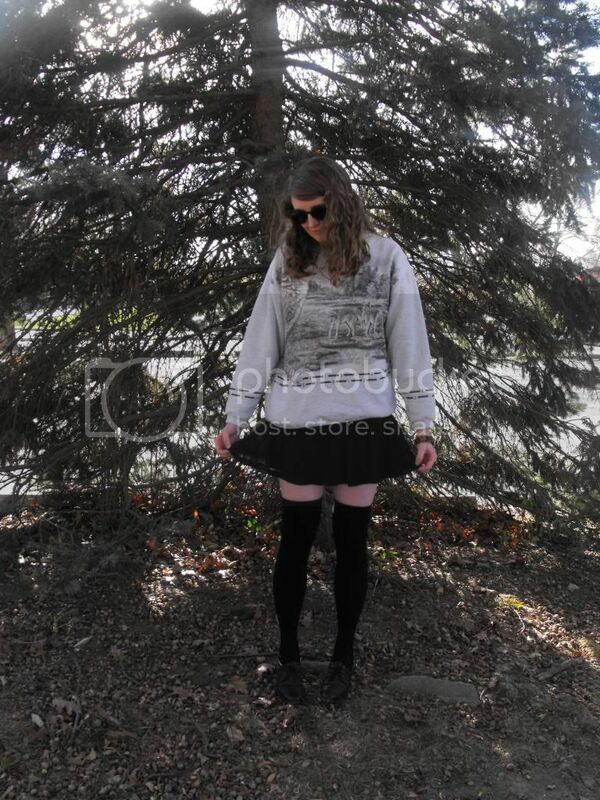 To follow Taisha's fashion inspiration, you can follow her on tumblr HERE. To see more of her everyday looks, you can follow her on instagram HERE. Also, a big shout-out to Terence for taking these photos- thanks! You can follow him on tumblr HERE. Hello! Today I have a new brand of footwear to introduce to you guys- LAMO footwear. LAMO carries shoes for women, men and children. They specialize in comfortable, functional footwear. They stock everything from cozy sheepskin boots to chic sandals. LAMO is based is Southern California and the LAMO lifestyle look is "relaxed, comfortable." 1. The Sammi in forest. $107.99. LAMO actually sent me these shoes to review but I have not gotten a chance to wear them yet. However, I've tried them on and must say that I am loving them! They are extremely comfortable and just so soft. I don't usually like shoes that are this shape but the color and fringe of these boots make me make an exception for them. 2. The Uptied Sandal in black. $54.95. I am swooning over these sandals. The tie-dye print and slight wedge just call my name. 3. The Bliss Slipper in fuschia multi. $34.95. 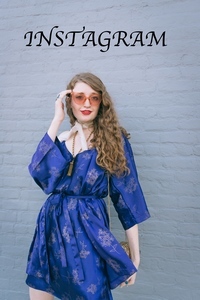 Talk about boho-chic! 4. The Lamo Rainboot Tall in black. $149.99. When it's raining cats and dogs outside, these rain boots would be a life-saver. Have you guys heard of LAMO footwear before? Hello! Today, I broke out my new dress that I received courtesy of SUPERbrand. SUPERbrand is an online shop that sells both womens and mens apparel as well as surfboards. The pieces that they sell are all very minimalistic yet still unique. All of their merchandise appears to be well-made and luxe. When I was told that I could pick out an item to showcase on my blog, my eye was instantly drawn to this black asymmetrical dress. And I am beyond glad that this is the item that I selected. The easy-breezy yet luxurious vibe of the dress simply has me swooning over it. The asymmetrical hem of the dress, silk straps and flow-y fit of the dress all update the classic LBD (little black dress). And one can never have too many little black dresses! I am also very pleased with the high-quality of this dress; it is very well-made and the fabric is splendid. The fabric is extraordinarily comfortable and not sheer whatsoever. Unfortunately, this dress is no longer for sale but you can check out other SUPERbrand apparel like this dress HERE. 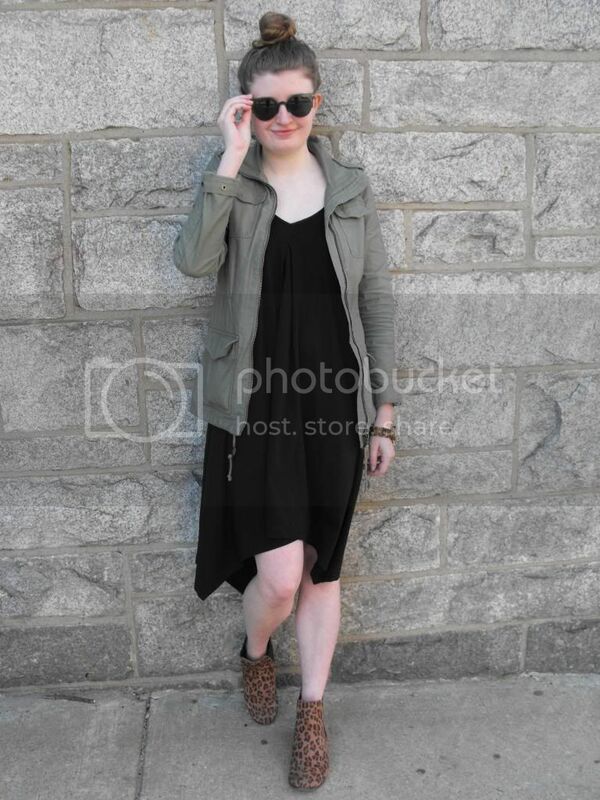 My roommate, Taisha, let me borrow her stylish army jacket to wear with the dress. 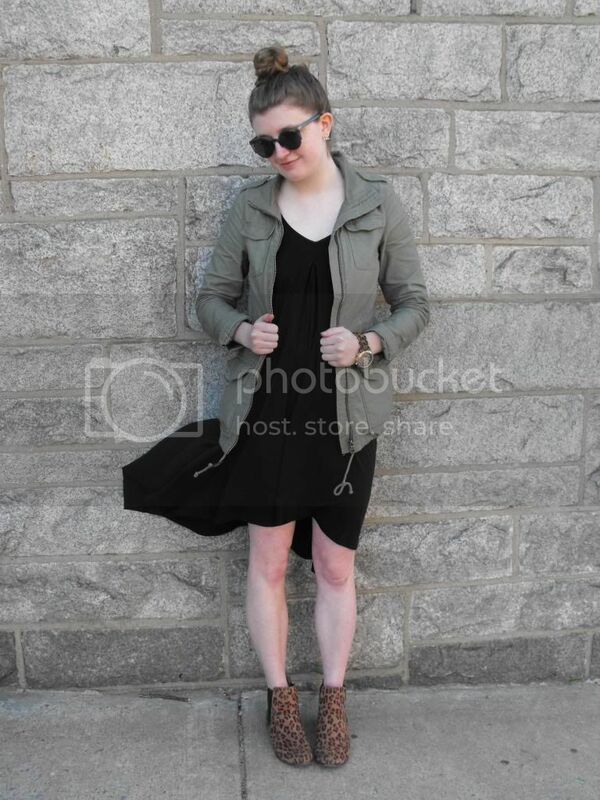 The shape and color of this jacket work perfectly with the dress. 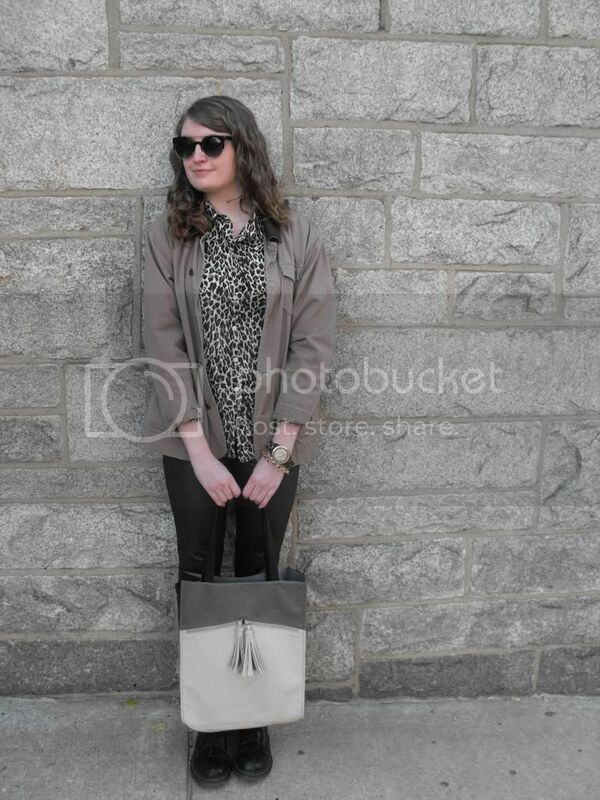 My look wouldn't be complete without a print so I threw on a pair of leopard print boots. 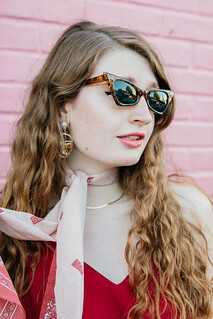 I accessorized with a tortoiseshell watch, Chanel earrings and chic sunglasses. Hello! It continues to get colder here in Philadelphia. In fact, it even snowed yesterday morning. I think that definitely means that it's time to break out the layers and winter apparel. For once, I actually pulled out a pair of pants from my wardrobe. Usually, I tend to shy away from jeans and pants but these metallic pants are an exception. Last August, I purchased them on sale for only $10 at H&M. Yes, only $10! How crazy is that? The metallic finish and high-rise waist instantly drew me to these pants. So luxe! 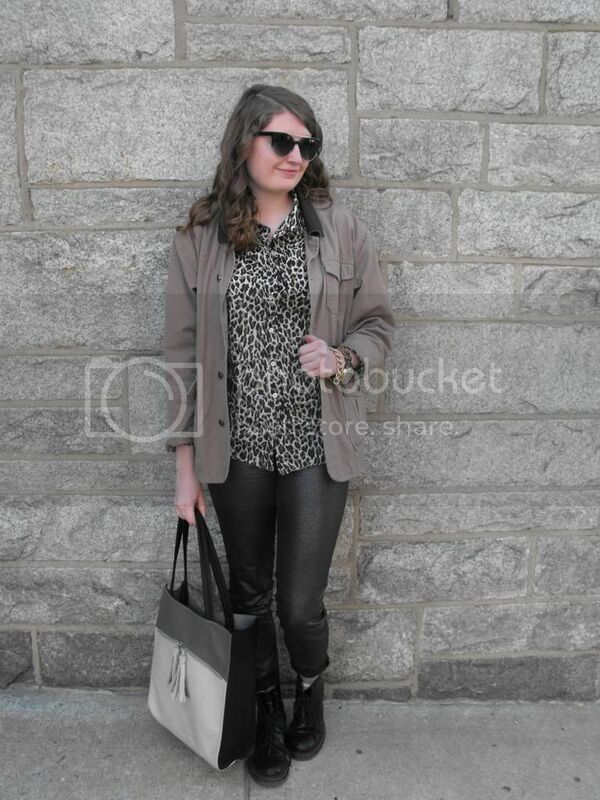 Today, I styled the pants with a chic leopard print button down. Of course, in this chilly weather I needed to wear more than just a button down so I grabbed a neutral-colored, vintage jacket to throw over it. I highlighted the darker colors in my leopard print top by slipping on my black Doc Martens (also known as the shoes that practically never leave my feet). I accessorized with a color-blocked tote (the perfect bag to bring to class), stylish sunglasses, several bracelets and a watch. As you guys may have noticed, these sunglasses are one of the latest additions to my wardrobe. Giant Vintage recently sent me these sunglasses to showcase on my blog. These are the "Sweetie" sunglasses in black. They retail for $20 + shipping and can be found HERE. 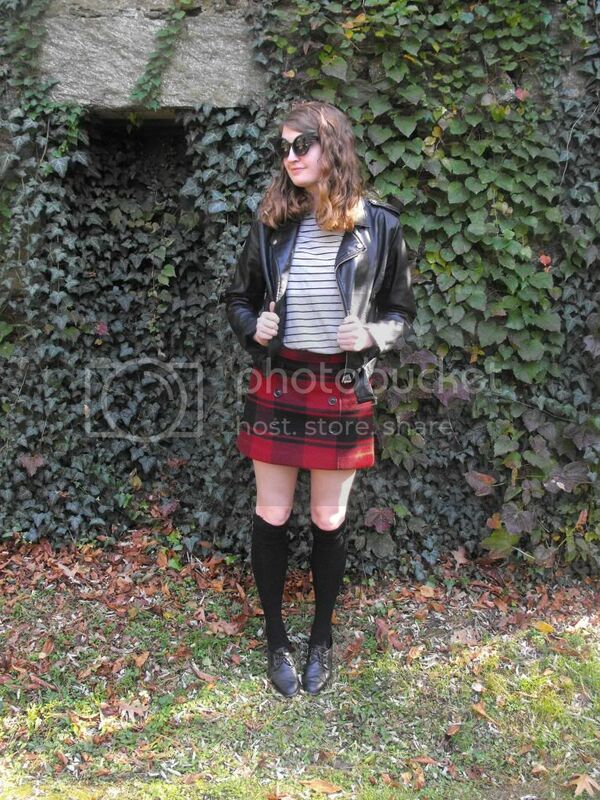 Giant Vintage never lets me down and I absolutely love these sunglasses. They are very classic with a slight twist and can be easily styled with numerous different looks. 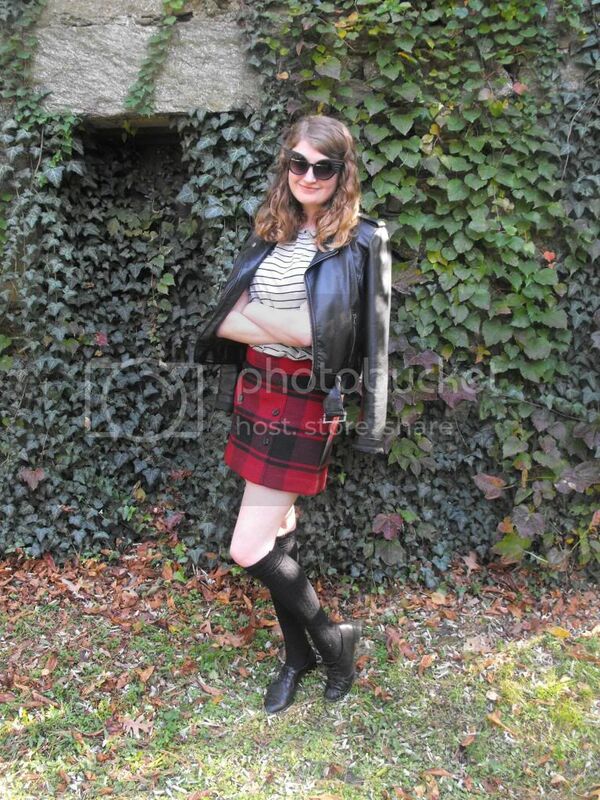 The watch that I am wearing in these photos is also a recent addition to my wardrobe. I recently received it complimentary of ShopLately. This is the "The Brooke in Tortoise Gold" and it is sold by Breda Watches HERE. It retails for $31.50 + shipping. For quite a while, I have been looking for a classic, versatile watch that I can easily slip on with most outfits. This watch fits that description completely. The classic tortoise print and oversize shape have me drooling over this watch. I definitely see myself wearing this watch time and time again this fall/winter. My only complaint with Breda Watches was that the shipping took a while. I ordered the watch on October 25, 2013 and it only came yesterday. So it took a little less than 3 weeks to get to me. Hello! November is one of my favorite months of the year. Hot cocoa, bundling up in scarves, the first snow of the season, curling up with a good book in a toasty room, Thanksgiving, dark colors... What's not to love? Above is some of my fashion/ beauty inspiration for this month. All inspiration taken from tumblr. What are you guys looking forward to this month? Hello! Yesterday, temperatures dipped into the thirties here in Philadelphia. Brrrr! I took that opportunity to bundle up in a cozy scarf and several layers. I styled my look around this black and white polka dot, body-con dress. First, I layered a gray, long-sleeved crop top over the dress to add a bit of warmth. For even more warmth, I threw on my black faux leather jacket. My look was cozied up even further when I threw on a thick knit scarf in a deep purple color. Of course, my legs needed a bit of coverage so I grabbed a pair of black opaque tights and layered a pair of gray and white polka dot socks over my black tights. I slipped on my Doc Martens and let the polka dot socks peek through. I have a major weakness for patterns and I would say that one of my favorite patterns would definitely be polka dots; they are just so classic and timeless. Overall, this look is probably one of my favorite looks in a while. The color palette consisting of blacks and grays with a pop of deep purple absolutely has me swooning. I find darker colors such as grays, blacks and plums much more aesthetically pleasing than bright colors. 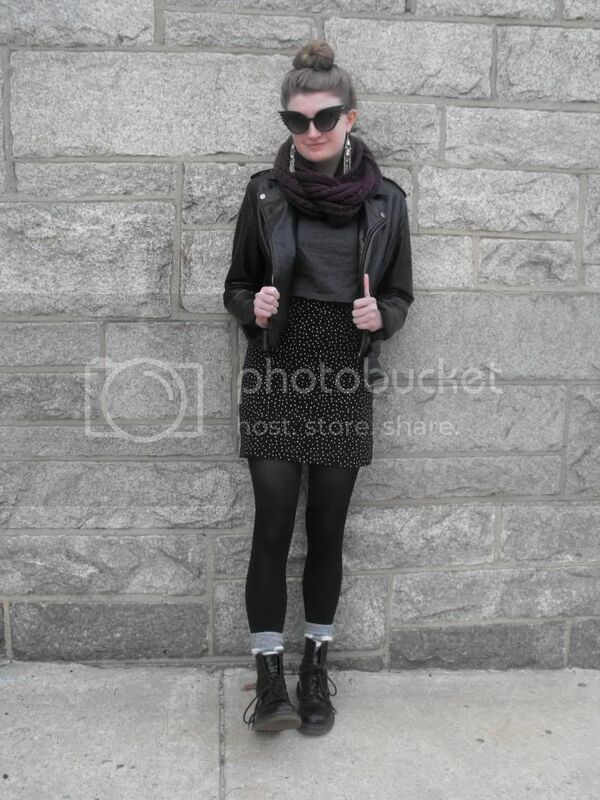 And winter is the perfect season to break out a wardrobe full of dark, moody colors. The layering in this look also really appeals to me. There is just something about layering that I cannot resist; I love combining different textures/fabrics, colors, prints, patterns, shapes, etc. The first of the "Holidays" is finally here. Halloween. While everyone has their favorite holiday, Halloween is special for fashion lovers. You can be anything you want for an evening, dress up, freak out, and party down. If you put off your costume until now, this special roundup has excellent last-minute costume and DIY ideas. Some of my personal best costumes have come literally 45 minutes before I headed out for the night. Of course you'll be wanting to take good care of your skin through all the costuming, with great tips for night skincare, Halloween beauty you can wear all year and when you're out late tonight, you'll want to speed up your routine tomorrow morning. Live well, be safe, and have a wonderful Halloween!